I really enjoy writing feature articles, typically for blogs. In my work with the International Arts + Mind Lab at Johns Hopkins, I’ve had the chance to cover some fascinating events that marry the arts and sciences. 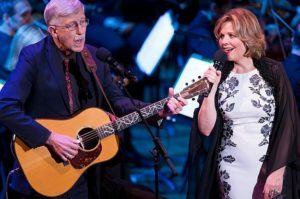 Two of my favorites were a talk by Alan Alda (who has a foundation dedicated to science communication) and the Sound Health concert at the Kennedy Center featuring a number of renowned singers and scientists – that’s soprano Renee Fleming singing with National Institutes of Health Director Francis Collins to your left. I take pleasure and pride in translating complex concepts into simple language and memorable stories.